Identify Black Scoter - American Scoter - Wildfowl Photography. Male - The male Black Scoter has an all-black plumage, brown eyes, a black beak with a large yellow bulbous knob on its base, and dark-grey legs and feet. Female - The female has a dark-brown hind-neck and crown extending down to the eye, a pale face, chin, and foreneck, a dark-brown body, and the beak is dark and can sometimes have some yellow around the nostrils. Size: - Typical Adult is 43-51cm (17-21in). Food: - Mainly molluscs and crustaceans, mussels, small fish, fish eggs, aquatic insects, larvae, seeds, roots, and tubers. Habitat/Range: - Lakes, rivers, pools in tundra and woodland, wintering along the coast, bays and estuaries. They breed in the far north of North America in Labrador and Newfoundland to the southeast of Hudson Bay, Alaska, and also the Bering Straits and Siberia (east of the Yana River). 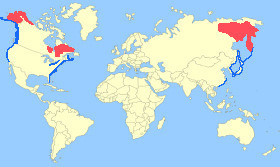 It winters further south on the coasts of Canada, northern USA, San Francisco Bay, Great Lakes, Atlantic and Gulf of Mexico coasts, and in Asia down to Japan, Korea, and China. Breeding Habitat/Resident, Migration or Winter Area. Breeding Season: - Begins May to June. Eggs: - 6 to 8 (Cream or pale buff). Notes: - The Black Scoter or America Scoter is a large sea duck which form large flocks over coastal waters during the winter. 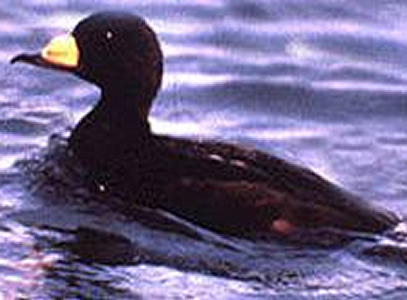 Very similar to the Common Scoter, they both belong to the subgenus Oidemia. Compare with other Duck species.